Zlatan Ibrahimovic admits he is missing Manchester United and his former manager Jose Mourinho. In an emotional video posted on United’s official Twitter page, the striker addressed his old club as they met for their end of season awards on Tuesday. United agreed to the mutual termination of Ibrahimovic’s contract in March, before the 36-year-old signed for MLS side LA Galaxy. 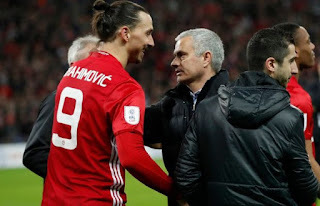 In a personal message to the United squad, Ibrahimovic said: “I see you are doing well. You made it to the [FA Cup] final, which I like a lot even if I am not there. “Here, everything is okay. I enjoy the sun every day.